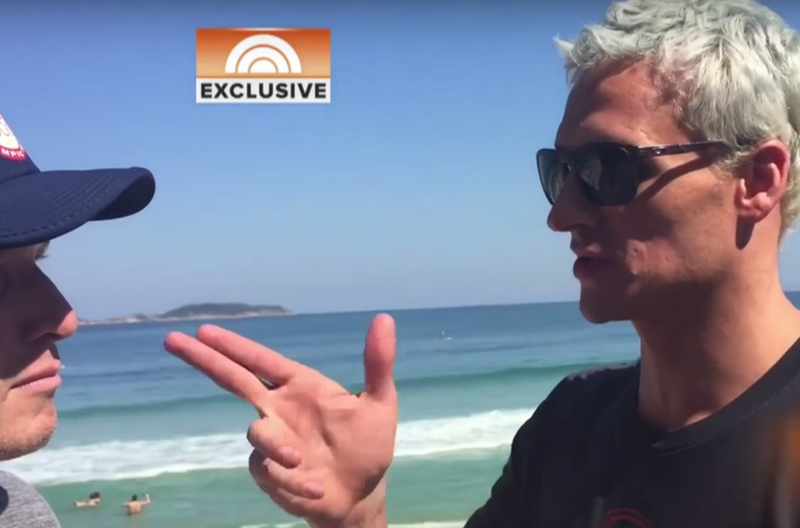 Ryan Lochte and three other U.S. Olympic swimmers (Gunnar Bentz, Jack Conger and Jimmy Feigen) are in hot water for allegedly fabricating a story of being robbed at gun point in Rio de Janeiro. Some have asserted this story was an effort to take attention away from alleged damage they perpetrated to a gas station restroom. This story is developing thus all the details are not yet known. At 2:44 in the above "Today" show video, Lochte continues, "... I'm not getting down on the ground and then the guy - pulled out his gun, he cocked it, put it to my forehead and said, 'Get down' - and I was like, I put my hands up, I was like 'Whatever'." It's inconsistent that Lochte pointed his fingers at the journalist (Billy Bush) - rather than himself when he said, "... put it to my forehead ...". If the gun was truly pointed at Lochte, in his re-enactment Lochte should NOT have taken the point-of-view of the alleged gunman. Notice also that Lochte did not point his fingers at Bush's forehead (where he said gun was aimed) - rather he pointed in the region of Bush's upper cheek and eye. Note that when Lochte points his hand toward the Bush to signify a gun being pointed at himself - Lochte uses both his index finger and his middle finger as a physical metaphor for the barrel of the handgun. This is extremely unusual. The handgun gesture is universal - anything other that only the index finger being used to signify the business end of the firearm is highly atypical (even with children playing this is true). Moreover Lochte's illustrator here is also inconsistent with the alleged aggressive nature of the story. Using two fingers softens up the pointing gesture significantly, making it feel much less invasive. Indeed this is why flight attendants famously point with these same two fingers rather than only an index finger (forefinger). Lochte is subconsciously leaking the truth by being less aggressive in his recounting - for no such gun or aggression was perpetrated upon him. Summary: Ryan Lochte's verbal recounting of the alleged robbery is inconsistent with his body language. When the verbal language is incongruous with the nonverbal language - it's the nonverbal which tells the truth. Nonverbal Communication Analysis No. 3512: Emilia Clarke in "Me Before You"